At a small shop in Sterling Heights, Michigan, a group of automotive craftsmen is stepping back in time, restoring and replicating Henry Fords 1901 racecar. While the glistening, high-tech conditions in which they work are nothing like what Ford faced 100 years ago, the recreating of SWEEPSTAKES highlights several similarities between that racecar and modern ones. On October 10, 1901, Henry Ford entered and won his one and only race. And if not for winning that race in front of some 8,000 spectators at the Detroit Driving Club in Grosse Pointe, Ford might not have created what is today the Ford Motor Company. Henry Ford entered that race to win money and get free publicity for himself and his ideas. After winning and receiving $1,000, Ford hit the front pages and his speed unofficially broke the existing land speed record of 68 MPH by 4 MPH. Why? Because the technology used by Henry Ford was so advanced. Modern-day racing ideas included tires with no treads, non-carburettor fuel injection system (rudimentary by todays standards), distributorless ignition and variable valve timing (camshaft lift). The racecar called Sweepstakes was also lightweight and sat low to the ground compared to racecars of that era  traits that are still sought after by race teams today. According to Miller, William Rands purchased the car from Ford early in the century, eventually donating it back so the Ford trade school could recondition it and rebuild the body. After a time at the trade school, its believed the car went to the museum in the 1930s but was not displayed for some 50 years. 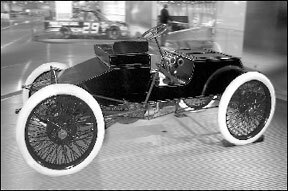 Ford Racing had the 1901 racecar replicated  in duplicate  for a wide variety of uses to celebrate 100 years of racing. The original engine has two cylinders, measures 538 cubic inches (close to 10 litres) and creates about 26 horsepower. By comparison, todays Ford production engines range from 2.0 to 4.6 litres, while making 130 to 300 HP. Henrys car was also lightweight. The other racecars had larger engines but heavier bodies. The body and frame are made of ash wood and the frame has steel plate reinforcement. The engine and pistons are cast iron, while numerous parts are made of brass. Iron is the component most used. The planetary transmission  a direct predecessor to todays automatic transmission  was side-mounted next to the engine with a chain drive to the rear axle. To think that if Henry Ford had not become famous after winning this race, he would most likely not have gone on to found the Ford Motor Company. Talk about betting the farm on one race!